Opponents of the Los Angeles Metropolitan Transportation Authority’s 710 Gap Closure project were celebrating a victory of sorts Tuesday when the Los Angeles City Council unanimously voted to oppose any extension of the SR-710 freeway through the city. Activists say they will now gear up to oppose a ballot measure that aims to fund related transportation projects. Cheers and whistles broke out after Tuesday’s 11 to 0 vote on a resolution authored by Councilmen Jose Huizar (CD-14), Ed Reyes (CD-1) and Eric Garcetti (CD-13). Reyes and Garcetti, however, did not attend Tuesday’s meeting; Councilman Bill Rosendahl (CD-11) was also absent. Originally introduced in 2009, the resolution opposes construction of the freeway in certain zones. It has now been updated to oppose specific alternative route proposals announced earlier this summer, including a controversial tunnel option. The resolution opposes routes F-2, F-5, F-6, H-2 and H-6, above ground projects that would have run through Northeast Los Angeles. The resolution also opposes option F-7, a tunnel alignment that would connect the 710 Freeway from its terminus in El Sereno to the Foothill (210) Freeway in South Pasadena. During Tuesday’s meeting, Huizar said he and other members of the council were originally told the tunnel route would benefit El Sereno, a neighborhood he represents, reducing traffic and pollution caused by commuters who use Huntington Drive to cut through the area after being dumped off the 710 freeway where it ends at Valley Boulevard. However, Huizar said he now distrusts the information provided by Metro and criticized the transportation agency’s outreach efforts as terrible and disrespectful to the communities most impacted. “A lot of time [at meetings] there was no translation for people who do not speak English, there was no technical staff available to answer technical questions—and we took that as a dog and pony show that didn’t take seriously the input the community would want to give. When we do get this information as to whether the tunnel makes sense or not, who is to say that it is the right information or that they are doing the appropriate outreach to decide whether it makes sense or not,” Huizar said. After the vote, several residents stopped to thank and congratulate Tina Golutta Miller, a Garvanza resident who helped organize efforts against the SR-710 freeway alternatives in Northeast Los Angeles. “This is historic, never in the 50 years of the SR-710 extension has the City Council brought to motion or publicly considered opposition of all the freeway alternatives throughout communities,” she said. Golutta Miller said Metro consistently failed to be transparent or conduct meaningful outreach. Northeast L.A. residents launched a campaign against the SR 710 freeway using three Facebook pages, including one in Spanish managed by El Sereno resident Gloria Castro, she said. “[Gloria Castro] has translated our press releases, flyers… that’s our multicultural outreach and Metro hasn’t done that,” Golutta Miller said, noting Metro’s website and Facebook page on the project are only in English. Several residents asked the city council to support the resolution, pointing out what they claim are defects in the project. “There are a lot of hotel workers present… ask yourself, do you think the people who are here fighting for a cause today would have the money to pay the toll road for a freeway should it be built,” said Trisha Gossett, a member of the Historic Highland Park Neighborhood Council. Gretchen Newsoon, Dr. Bill Sherman and others said goods movement is at the heart of the freeway expansion project, but there’s a lack of transparency where the topic is concerned. “You cannot get Metro to say the word ‘truck,’” said Janet Dodson, also a member of the Historic Highland Park Neighborhood Council. Dodson said a rail project should be considered to move goods inland for national distribution. The technology exists to address the flow of traffic on the streets as well as move goods with heavy electric rail near the ports, she said. 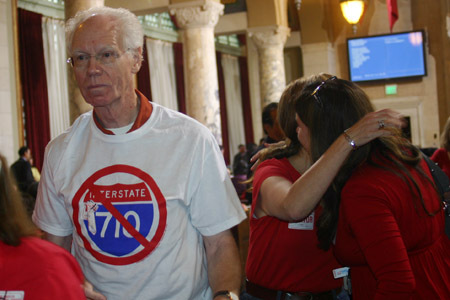 Supporters of the resolution wore red and anti-710 Freeway buttons. Golutta Miller said the SR 710 Gap Closure project is intertwined with the 710 Corridor Expansion project that focuses on widening an 18-mile stretch of the freeway from the Port of Los Angeles to East Los Angeles and Commerce. Measure J is a half-cent sales tax, similar to Measure R, which would fund transportation projects. The measure will be on the November ballot. She said people want a freight rail to carry cargo, and electric rail to get it to the ships. The SR-710 gap closure project seeks to alleviate regional traffic congestion and close the gap between the 710 Long Beach Freeway and 210 Foothill Freeway. But the vote by the Los Angeles City Council, while significant, is not the final word on the subject. The Metro Board includes representatives of the County and several other cities, some of whom may favor expansion. Metro staff has repeatedly said that no final route or plan has been determined, and that they are still gathering input from the community. The remaining alternatives still under consideration include a “No build” option, a bus rapid transit route (BRT-6) from Los Angeles to Pasadena, a Light Rail route (LR-4) from East Los Angeles to Pasadena, and intelligent traffic systems option (TSM/TDM – Transportation System Management/ Transportation Demand Management) such as light synchronization and enhancing current bus lines. An Environmental Impact Report is expected to be released in early 2014. A hotly protested highway route through Highland Park and other parts of Northeast Los Angeles is not among the five possible 710 Freeway extension project options still under consideration by Metro, the transportation agency announced last week. Those who opposed the route said it would destroy local communities and tear up neighborhoods with historical homes. It turns out engineers were not so excited about the route option either. The Highland Park route was taken out because it was “poor performing from an engineering and financial standpoint,” said Metro spokesperson Marc Littman. —F-2: Route from SR 2 (Glendale Freeway) between Verdugo Road and SR 134 with a new interchange. —F-5: Route to SR 134 at a new interchange—just north of the intersection of Colorado Blvd/Avenue 64. —H-2: Route from Concord Avenue, Fremont Avenue, Monterey Road, Ave 64, Colorado Blvd. —H-6: Route between the termini on Huntington Drive, Fair Oaks Avenue, Columbia Street, Pasadena Avenue and St. Johns Avenue. The five remaining proposals include routes using bus rapid transit, light rail, or freeway tunnel and intelligent traffic systems (which includes strategies such as ride sharing and encouraging off peak traffic). Pictured here Bus Rapid Transit route (BRT-6), one of several options still on the table. 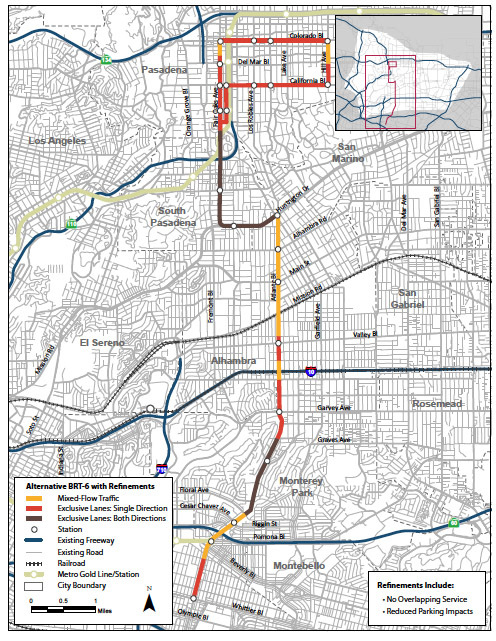 —Bus rapid transit route (BRT-6): from Los Angeles to Pasadena. —Light Rail (LR-4): route from East Los Angeles to Pasadena. —Intelligent traffic systems option: is considered a “low build” alternative (TSM TDM), for example light synchronization; enhanced bus line enhancements. —F-7: tunnel alignment, although it has depressed and at-grade sections at the north/south ends. Route would go from the north and south terminus of the existing SR 710, to north terminus the 210 freeway. Littman said Metro staff has not yet determined a route for the freeway tunnel option, and added that rumors about the tunnel alternative have exaggerated its costs. He said recent studies conducted in Seattle and other cities put the cost of a tunnel at around $3 billion, rather than the $15 billion figure floating around. Since the route has not been decided, the exact cost is still unknown, he said. Details about these alternatives were presented at a technical advisory meeting on Wednesday, and a Stakeholder Outreach Advisory Committee today, Aug. 30. Over a dozen Navy Recruitment Division officers attended a recruiting training session at the Eugene A. Obregon American Legion Post 804 in unincorporated East Los Angeles last Friday. The officers will soon begin their recruitment efforts in East Los Angeles, which has some long-time anti-war activists concerned. The training session came on the eve of the 42nd Los Angeles Chicano Moratorium, the largest demonstration of Mexican Americans in history against U.S. foreign policy, and the Vietnam War in particular. For years, Mexican American and other Latino activists have fought to stop military recruitment on local, mostly Latino high school campuses. News that Navy recruiters were in East Los Angeles for training does not sit well with Rosalio Muñoz, executive director of the non-profit Chicano Movimiento Resource Center of Los Angeles. In 1969, Muñoz was among the people strongly opposed to the Vietnam War. He refused to be drafted, and was involved in the anti-war movement and planning the Chicano Moratorium. Chicanos — mostly Mexican Americans —were being sent to the front lines, he said. The number of young Chicanos being killed overseas was disproportionately high given the size of our population, he explained. University of California San Diego Professor Jorge Mariscal — who has published books on the Moratorium and recruitment efforts in the Mexican American community—told EGP in an email that Mexican Americans have a long, but overlooked tradition of military service. Opposition to Vietnam was pivotal to creating awareness of the role Mexican Americans had played in US wars, according to the professor. “The efforts to stop the war and end the draft was important for a community that had been seen as passive for many decades,” Mariscal wrote in his email. Today, Muñoz is one of the curators of a multi-media exhibit currently open at the Mexican Culture Institute of Los Angeles chronicling the Chicano Movement of the 1960s and 70s. According to Muñoz, the exhibit presents Chicano history in its true form, not the version distorted by the media. Muñoz explained that many of the efforts in the Chicano Movement dealt with civil rights, including the right to a better education—often side-tracked by military recruitment. “We want the policy to be education for our children, and money to lower the cost of an education,” Muñoz said. “The cost [to attend college] is so high that kids will go into the service and be recruited with promises that are only partially kept,” he said. A report on Latino veterans published this month by the Center for American Progress states the percentage of Latinos in the military —13 percent in 2008— is on the rise. The educational scholarships granted through the Post 9/11 GI Bill, are often the reason for enlisting. But not everyone thinks military service is a bad thing. Tony Zapata, Commander of the Veterans of Foreign Wars in East Los Angeles served in Vietnam, following a family tradition of military service. He invited the Navy recruiters to the post and advocates for them going into high school campuses—something Muñoz and Mariscal disapprove. Like Muñoz and Mariscal, Zapata acknowledges the importance of higher education for local youth. Assistant Chief Recruiter Aaron J. Smith was at the training session last week. He told EGP the Navy offers up to $180,000 in scholarships for college, and simultaneous work experience that can make young people more marketable. He said that while enlisting is not the only way to access an education or a job, it is a way that comes with many benefits, including healthcare, paid vacation and even home loans. Professor Mariscal, however, contends that the long-term benefits the military claims are deceptive. “Training received in the military does not always translate to civilian jobs; studies show that people who serve in the military make less money over a lifetime than those who go directly to college or civilian job training,” Mariscal told EGP. Jose Frank Flores, a Navy recruiter based in Bakersfield, notes that enlisting can help expedite citizenship for enlistees with a green card. Muñoz says there are better ways to become a citizen. “Higher education and good jobs [offer] faster access to citizenship than going somewhere where you can be killed, or will be killing innocent people,” Muñoz said. Smith told EGP that recruiters recognize and respect community opposition to recruiting on school campuses, and the backlash over the benefits offered, but in some cases not received. But he argues that it’s often due to lack of information. “Either they have a misunderstanding of what we do, or they had a bad experience in military service,” Smith said. Flores told EGP that misconceptions of equal opportunity in the Navy make it imperative to properly train recruiters to accurately and honestly convey information. “We have this policy of being honest because the recruiters know they have this stigma of being used car salesmen, and that’s not true,” Flores said. Holding training sessions at the VFW Post in East L.A. he said, would help “promote awareness of the Navy so that both the past and present get recognized.” He emphasized that recruiters do not enlist young people, but merely offer them information on a possible option that will ultimately come down to their individual decision. 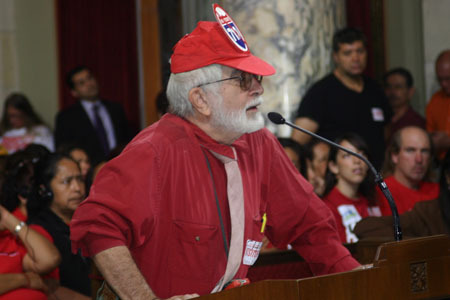 While their views on military recruitment in East Los Angeles may differ, both Zapata and Muñoz agree that too many of the area’s mostly Latino youth are unaware that Chicanos have a long and valiant history of service overseas in the US military and in combat; or for that matter, the Chicano Movement stateside. Each is doing his part to educate the community. The nonprofit Chicano Movimiento Resource Center of Los Angeles is working on establishing a permanent exhibit in the city to educate the greater community year-round, according to Muñoz, who visits East Los Angeles schools to help teachers develop ways to teach the history. Zapata visits schools as well, but also reaches out to immigrant parents to help them understand the significance of the country’s Veterans’ holidays. In a similar vein, Muñoz stresses the significance of past Chicano efforts in laying the groundwork for future generations. 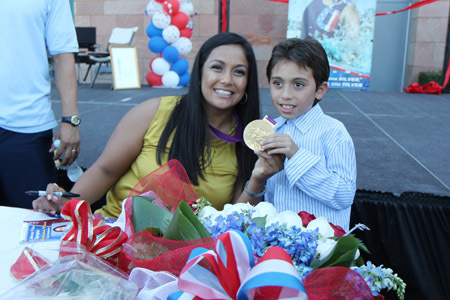 Commerce renamed its aquatics center for Olympic gold medal-winning water polo player Brenda Villa on Aug. 26. Villa was raised in Commerce and began swimming with Commerce Aquatics when she was 6 years old. Villa was also a member of the silver medal-winning U.S. women’s water polo teams in the 2000 and 2008 Olympics and the 2004 team that won a bronze medal. Villa played on the boys’ water polo team at Bell Gardens High School, and was a four-time, first-team All-Southern Section selection. She helped lead Stanford to the 2002 NCAA women’s water polo championship. Still vacant lots cleared for the construction of the Eastside Gold Line Extension, a light rail line opened three years ago, were the main topic of a town hall meeting held last week in Boyle Heights. 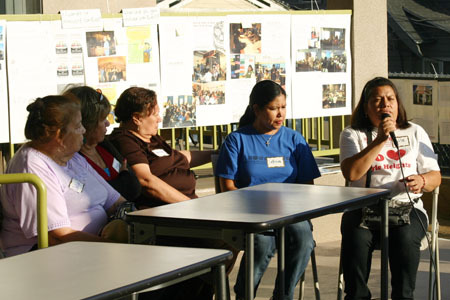 The “Take Back Boyle Heights” meeting was put on by the East Los Angeles Community Corporation, ELACC, which has undertaken a campaign to influence developments in the low-income and working class community. During the town hall, several residents served as panelists, sitting in seats where photos of some of Metro’s key decision makers, like County Supervisor Gloria Molina, Los Angeles Mayor Antonio Villaraigosa and Metro CEO Art Leahy, had been taped to the chairs. Blanca Espinoza was one of the first to speak: “The plots belong to them but we are the ones who live here,” she responded when asked why Metro should form a community advisory committee. Panelists, responding to questions, emphasized the need for a grocery store, affordable housing, and construction jobs for residents of Boyle Heights. They also said greater participation from the community is needed if they hope to achieve these development goals. “We cannot be without a grocery store,” panelist Delia Castillo said. Eight plots located primarily along First Street in Boyle Heights are slated for development, and all but two already have developers lined up, according to Reina Fukuda, ELACC community organizer. Earlier this summer, one of the development was singled out for opposition: a residential and commercial building planned for a two-acre plot of land owned by Metro, located near King Taco on the southeast corner of Soto and Cesar E. Chavez. In June, residents affiliated with ELACC protested the project. They said they want a grocery store and affordable housing, not another national retail pharmacy and condominiums. A Walgreens had just opened a few blocks away on Cesar Chavez Avenue. It replaced Big Buy, the only grocery store in that part of Boyle Heights. In a letter to Metro Board of Directors Chairman Michael Antonovich, ELACC and others said the proposed development would be a wasted use of scarce vacant land; threatens two long-time family owned pharmacies; promotes car use with its excessive surface parking, and lacks a feasible affordable housing component. They also said the development would disrupt pedestrian traffic and transit use along the Cesar Chavez corridor. If approved, the community would be denied the opportunity to restore lost assets, like a supermarket and affordable housing, they wrote. ELACC Associate Director Isela Gracian and the leadership of several organizations, including Legacy LA, InnerCity Struggle, Union de Vecinos, and a staff attorney for Public Counsel, signed the letter. Developer JSM Capital, LLC could not be reached for comment. During the town hall meeting, a representative from developer “A Community of Friends” presented preliminary plan for a mixed-use development at 1st Street and Lorena. The development is still in the very early planning stages, the audience was told. For the most part, residents liked the presentation, though they did tell the developer that they want current Boyle Heights residents to have first option on the housing to be built. The developer explained that the proposed facility is being built to house people who are homeless, and that fair housing laws require housing be made available to all qualified applicants. Audience members Juaquin Castellanos and Rosalie Gurrola expressed concerns that A Community of Friends’s proposal could create a homeless problem where previously there wasn’t one. “We know that Community of Friends has a place next to the Police Station and it has [caused] many problems,” Castellanos told EGP in an email following the meeting. “We use to have meetings at the place for years,” but we were kicked out because we made a lot of complaints to them about their tenants, he said, adding that he and others intend to oppose the project should planning go forward. But other residents just wanted to know how they could apply for one of the units at the proposed development. The desire for a grocery store was repeatedly emphasized. Castellanos said he would like to see a Fresh & Easy or Vallarta grocery store open in this part of Boyle Heights. Other residents said they want another Big Buy, or a Food-4-Less. Boyle Heights business representative Christina Ramos said she disagreed with some of ELACC and the resident’s demands, but agreed that a Residents’ Advisory Council could prove beneficial in voicing the community’s interests. The other Metro-owned plots to be developed in Boyle Heights are located at: 1st & Lorena streets; 1st & Soto streets (southwest & southeast corners); 1st Street & Boyle Avenue, (northeast corner); Soto & Cesar E. Chavez (southeast corner, near King Taco); 1st & Boyle Avenue (southwest corner); and Mathews & Ficket (on Cesar Chavez Blvd). The unincorporated East Los Angeles-based Save the First Street Store Coalition experienced both a setback and win yesterday at a public hearing of the Los Angeles County Regional Planning Commission. The coalition, concerned that construction for a new charter high school on the former site of the First Street Store could result in the destruction of an important and culturally significant 18-panel tiled mural titled the “Story of our Struggle”, sought to block the commission’s approval of the building project. The commission unanimously denied the coalition’s request that a full Environmental Impact Report (EIR) be conducted on the First Street Store site; granting Pacific Charter School Development (PCSD) approval to move forward with a transitional parking project that will demolish a small back portion of the former First Street Store. The existing parking lot and area to be demolished will serve as a parking zone and drop-off area for the proposed Alliance College-Ready Middle Academy, which will replace the Ranch Market next-door. PCSD — which is handling the development for Alliance —did however announce that it has amended confusing language in the middle school proposal. Language that Commissioner Esther L. Valadez said could have been interpreted as allowing for demolition of the First Street Store. The revised language now guarantees that the store’s façade, and thus the mural, will be protected during the middle school and parking projects. It does not, however, guarantee the same protection for the new high school building project: those design plans have not yet been submitted to the commission for approval. “The construction of the middle school is not contingent in any way, shape, or form with the property next-door,” Alex DeGood, an attorney representing PCSD said. Nonetheless, the hearing did get heated when speakers for the coalition raised their concerns about the high school project proposed on the First Street Store site. Charter school operator Alliance College-Ready Public Schools owns the property in question. The group’s president and CEO, Judy Burton, told EGP that they have not yet “officially” started planning the high school build project or submitted plans to the commission. But according to public comments made at the meeting, the charter operator has been notifying the community that the high school is coming. Bringing up a draft blueprint for the project, Commissioner Harold V. Helsley said he suspects the group is taking a “piecemeal” approach to the project—referring to a tactic where a group purposefully separates projects in order to ensure completion of both. DeGood denied the accusation and said PCSD has no jurisdiction over what Alliance does with its own property. Burton told EGP that Alliance never had any intention of demolishing the mural and that re-using the First Street Store for a high school would be “an opportunity to revitalize the murals.” An online rendering of the proposed high school shows the mural panels redistributed throughout the school’s exterior. Boyle Heights native and Alliance parent Isela Zamora admires the coalition’s efforts, but argues that they’re over-complicating the issue. “I like what they’re doing with preserving it, but [Alliance] isn’t throwing it away, they’re keeping it,” Zamora said. “The murals are integrated with the architecture and cannot be removed without harming the artistic integrity,” Brant-Hawley said. Isabella Rojas-Williams, executive director of the Mural Conservancy of Los Angeles, added that relocating sections of the mural around the proposed high school would ruin the message, since the pieces are connected in a chronological order, narrating the Mexican-American history in the community. While the coalition is concerned over preserving a major landmark of the community’s culture, Alliance parent Maria Avilas said that a school for the community’s youth should take precedent. “We have to support our children, and our culture, we keep in our hearts,” Avilas said. Brandt-Hawley said PCSD’s wording change in the middle school proposal is “a step forward,” but added that the coalition is now looking into appealing to the Los Angeles County Board of Supervisors. The coalition also succeeded in bringing the mural’s future to county officials’ attention. “Because of the efforts today we took notice of a historic monument,” said Commissioner Valadez. Update: AB 2189 passed the Assembly on Aug. 30, the Governor has 30 days to sign the bill into law or veto it. A bill to allow undocumented youth under the age of 31 to apply for a California driver’s license could be headed to the governor’s desk for his signature. Assemblyman Gil Cedillo (D-Los Angeles) was able to amend AB 2189, with support from the bill’s original author, Assemblywoman Nancy Skinner of Berkeley, to include language that would allow undocumented youth who qualify to receive a work permit and avoid deportation under a new Obama Administration program, to apply for a state issued driver’s license. By amending an existing bill, he was able to get around the state’s lapsed deadline for submitting new bills. Under the Deferred Action for Childhood Arrivals, or DACA, eligible candidates are undocumented youth who came to the US before age 16 and who are under 31, in school or have completed school, or who have served in the military. Excitement over DACA caused many to assume they would also be eligible for driver’s licenses. But some states, like Arizona and Nebraska, have already announced they will prohibit these soon to be newly classified undocumented immigrants from receiving driver’s licenses in those states. Cedillo originally intended to find an administrative solution to enable the so-called Dream Act eligible youth to obtain a driver’s license, but decided to introduce the revised legislation shortly after the Department of Motor Vehicles (DMV) indicated that it appeared only certain types of federal immigration documents would support the issuance of a California driver’s license, making it unclear if documents issued under DACA would meet those requirements. Under AB 2189, which originally would have allowed people to use a photograph to rent a car, a California driver’s license can be obtained using any federal document received by a deferred action beneficiary as proof of legal presence in the state. As of press time, the bill was still making its way through the Legislature, but is expected to make it to the governor’s desk by the end of the week. Cedillo has been trying to get legislation passed to allow undocumented immigrants to receive a driver’s license since 1998. In 2003, SB 60 was signed into law by then Gov. Gray Davis, but Gov. Arnold Schwarzenegger repealed it before it went into effect. He tried numerous more times to get the bill passed, most recently in 2010, but it died in committee. It may not have been as historic as Neil Armstrong landing on the moon, but the occasion may have inspired several Roosevelt High School students who were among a select few who got to hear, in person, the first ever live broadcast of a song from Mars. Beamed from more than 700 million miles away, swelling orchestral music filled a room at Jet Propulsion Laboratories in Pasadena on Tuesday, lifting up a hip-hop ode to the wonders of science. The song, “Reach for the Stars,” composed by Boyle Heights-native and musician will.i.am, was transmitted by the Curiosity rover, an un-manned robot exploring the surface of Mars and collecting data for research into the red planet. 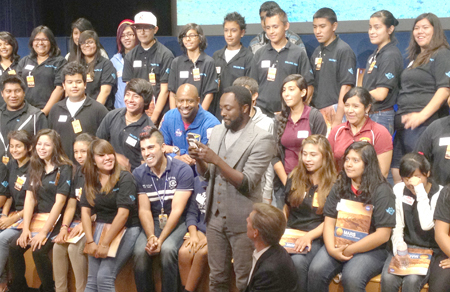 will.i.am, who was with the students at JPL for the interplanetary unveiling of the song, says the program he set up last year to inspire students from Boyle Heights and East L.A. to pursue science, engineering, technology and math careers, often draws a connection between the arts and science. “If you know music, you know math,” he said. He also pointed out that without scientists there would be no radio or record players. will.i.am said being in the program does not mean students will automatically decide to enter the science and math fields, so he decided to take extra steps to encourage them. During the unveiling, he exchanged stories with NASA astronaut Leland Melvin about how support from family and friends motivated them to reach for their dreams. will.i.am explained that his mother sent him to a science magnet in Brentwood, an hour away from Boyle Heights. Melvin said he got to create the most “fantastic explosion” using the chemistry set he got from his parents. “Once you’re encouraged you don’t see boundaries,” said will.i.am.